Here's one that didn't get away. 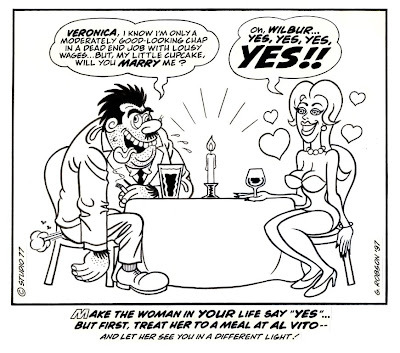 I was in my local chip shop one night and the owner asked me if I'd do a cartoon to advertise his delivery service. Rather than take the man's money, I asked for a fish supper every week for a year. (With an onion and a beetroot for good measure.) Not too bad for half an hour's work, eh? Above is the finished article which appeared on his shop bags and leaflets for years; below is the "rough" of the initial idea. 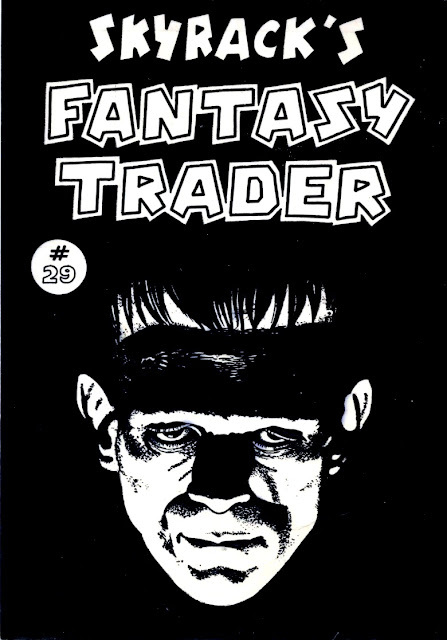 Here's one of the art samples I showed to 2000 A.D. editor STEVE MacMANUS at a Glasgow comic mart back in October of 1984. 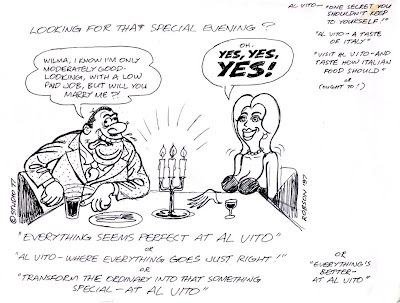 The lettering was done with a fountain pen and was a far cry from being truly professional, but it was enough to give Steve an idea of my potential and eventually resulted in me freelancing for IPC about three months later. The lettering may be far from perfect, but I was always proud of the rather clean pencilling which it adorned, so I thought I'd share it with you here. The above pic is a B&W copy of a colour cartoon for a proposed ad for a local restaurant, which I did some years ago. 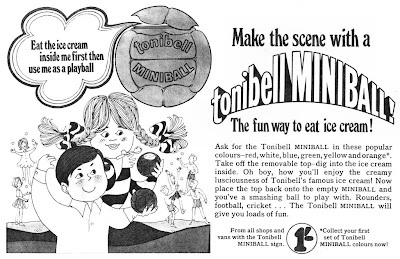 (It's a shame I no longer have a colour copy 'cos it was quite nice.) 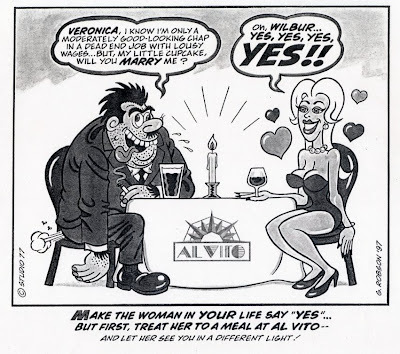 However, rarely does a cartoon (or any illustration for that matter) spring full-blown from the hand of its creator; it usually undergoes a process of development 'til the finished result is reached. Let me show you what I mean. Below is another rough of the proposed final drawing - this is essentially what I'm aiming for. And now the finished line artwork. I added the restaurant's logo to the tablecloth and then coloured it with acrylic inks. The finished pic was very effective, but unfortunately I gave it to someone, so only the B&W and grey copy at the top of the page remains in my possession. You'll just have to imagine it in colour - the guy has a blue suit and the girl has a red dress, if that's any help. Trust me - it was nice. And guess what? After all that work, I decided to abandon the project when my fee was questioned, so it never saw print. Just another day in the life of a cartoonist, eh? A while back, I posted an unused cover for HUGH CAMPBELL's '80s fanzine, FUSION. 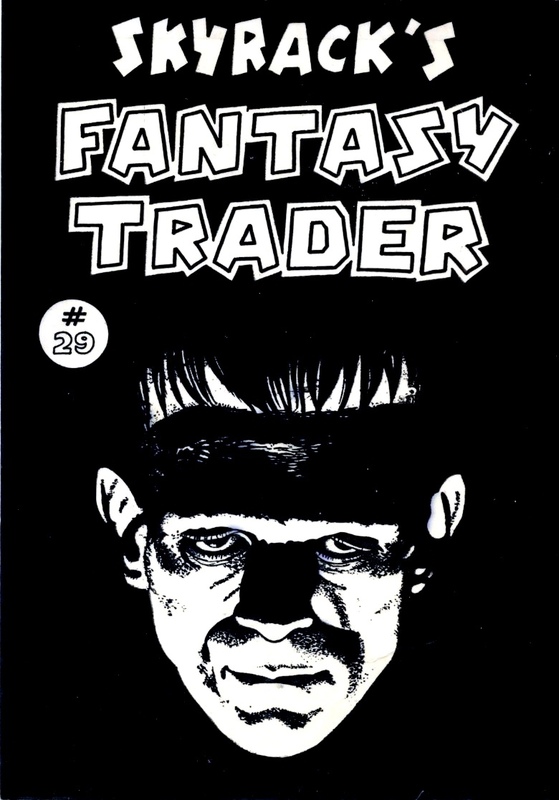 The illustration was one I'd drawn back around 1981 or '82, and as I previously mentioned, I'd first used it for a suggested cover for RON BENNETT's fanzine/catalogue, SKYRACK'S FANTASY TRADER, though I never got around to sending it. So, 27 years later, here it finally is... quite effective, even if I say so myself. "I've lost my front door key!" Hopefully, MOEBIUS MODELS will get around to reissuing this kit in its original form (with original box art) in the near future. Why not contact them at http://www.moebiusmodels.com and suggest it? Go on, you know it makes sense. Here's a strange little story for you concerning the item in the above ad. 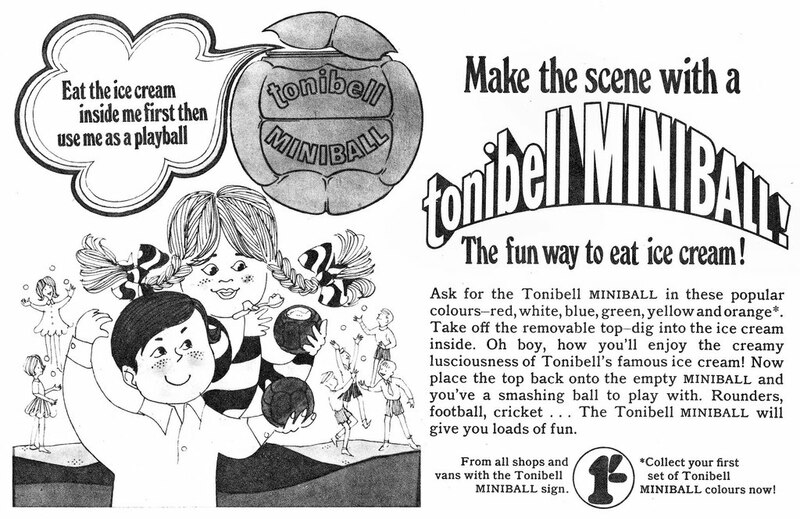 I bought my one and only TONIBELL MINIBALL back around 1967 or '68. (Hard to believe it was over 40 years ago.) When I moved house in 1972, I was sure I'd brought it with me to my new home, but, mysteriously, I couldn't find it. I'd kept it behind the water tank up in the attic, and I was sure I'd retrieved it the night before moving, but - search as I might in our new abode - it was nowhere to be found. Over the years, I'd regularly have dreams in which I'd find myself back in my old house, searching for my trusty pal from childhood. 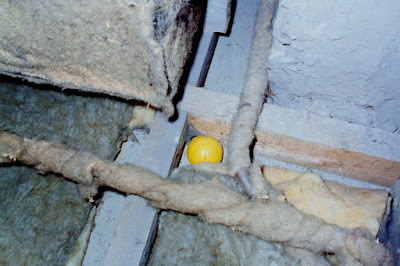 Anyway, to cut a long story short, 19 years later I decided to determine its fate once and for all, and managed to gain access to my old house and attic - and was overjoyed (if flabbergasted) to discover my little yellow Miniball exactly where I'd left it so many years before - completely untouched. So, not only was I the last person to see it back in 1972, but also the first to clap eyes on it again in 1991. Strangely, the 19 years that have elapsed since I retrieved it don't seem a fraction of the time it lay undiscovered and neglected for the same period. And guess what? I've never had those dreams again since that day I finally solved the mystery of the disappearing little yellow ball. 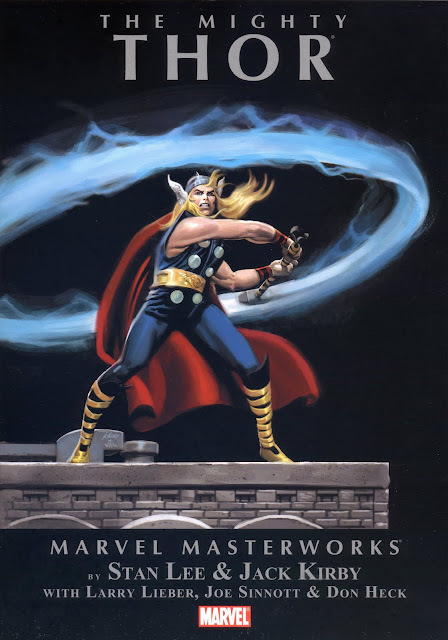 I'm glad to be able to say that MARVEL have done themselves proud with the release of the softcover THOR MASTERWORKS volume. Quite simply, these tales, from JOURNEY Into MYSTERY #83-100, have never been presented better - anywhere. 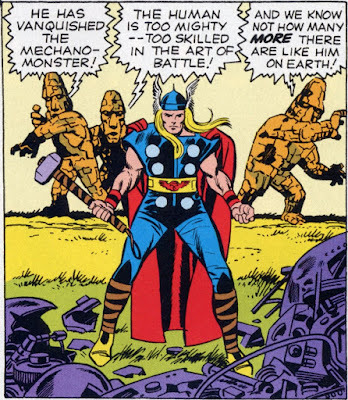 For the first time since its initial printing back in 1962, Thor's origin is reproduced - in colour - from pristine proofs, with no evidence of clumsy, so-called 'restoration' or 'reconstruction' as was the case in a whole load of earlier reprintings in recent years. 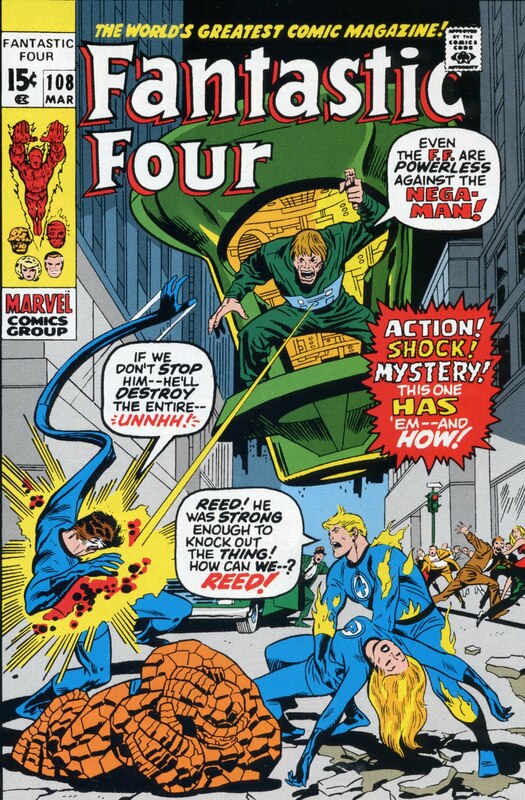 Following my post on FANTASTIC FOUR: The LOST ADVENTURE, I'd like to look at another of the fantasies surrounding the original printing of this story in FF #108. I've previously addressed JON B. COOKE's idle speculation that STAN LEE may possibly have delayed printing JACK KIRBY's version out of spite, so I'd now like to examine the suggestion that it was released the same month as the first issue of DC COMICS' (then National Periodical Publica-tions, Inc.) NEW GODS title in a malicious attempt to sabotage its launch. Sound plausible? Let's examine the facts. Kirby's first comic to be released by DC was SUPERMAN'S PAL JIMMY OLSEN. When New Gods hit the stands (six months after Kirby had left MARVEL) no special attention or promotion was given to FF #108; Kirby wasn't mentioned on the JOHN BUSCEMA cover and the Kirby content was bookended by a Buscema splash and end page, with quite a few redrawn panels inside the book - rendering Kirby's involvement practically invisible 'til the reader got the mag home and sat down to read it. Hardly the way to create an impact and steal New Gods' thunder, I'd suggest. Marvel were trying to establish Big John Buscema as the FF's new regular, superstar artist (after four issues by JOHN ROMITA), so that would surely count against them harping on about the past glory that was Jack. And sales on 'The World's Greatest Comic Magazine!' actually increased after Kirby left the book (as they did with SPIDER-MAN after STEVE DITKO departed) so, Stan Lee's personal sadness aside, Marvel wouldn't have been overly concerned over the King's departure. The most likely explanation seems to be that the story was printed simply because it had been paid for - and once Stan had worked out the problems with it and incorporated it into a longer, more cosmic story arc, there was no good reason not to print it. When one examines the evidence, the fact that FF #108 featured Kirby material and came out the same month as New Gods #1 seems to be nothing more than coincidence, otherwise Marvel surely would have hyped it to the rafters. They didn't - which puts paid to that little notion as far as I'm concerned. That's the trouble with most "conspiracy theories" - they seldom withstand scrutiny when measured against the plain and simple facts of the matter. For previous post on this topic, click here. Thinking about it, artists like RON EMBLETON, FRANK HAMPSON, DON LAWRENCE, and FRANK BELLAMY were very much the ALEX ROSSes of their day. Don'tcha think? 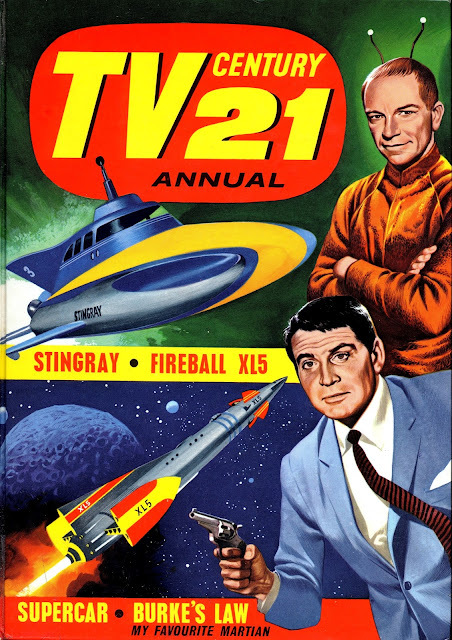 To see the 1967 Annual, click here.